Join the doctor at ProcureCon Canada! 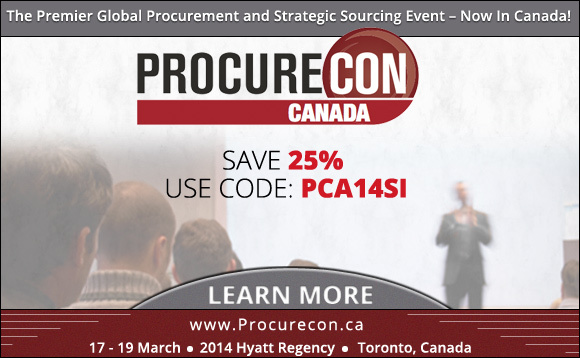 ProcureCon Canada will take place from March 17 through March 19, 2014 at the Hyatt Regency in Toronto. Attend and join over 100 leading practitioners in Sourcing and Procurement to share insights, best practices, and case studies to drive your Supply Management in 2014. Sourcing Innovation readers save 25% when registering with code PCA14SI. Click here to learn more. So join ProcureCon Canada and the doctor who will be moderating the panel on Optimizing Spend Analysis and Visibility to Maintain Cost Reductions at 11:55 am on Tuesday, March 18, 2014. If you’re looking to start a spend analysis effort or improve the returns from your current effort, this is a chance to get some of your questions answered. In addition the e-Book Spend Visibility: An Implementation Guide, co-authored by the doctor and Bernard Gunther (of Lexington Analytics, which was acquired by Opera Solutions), is still free and available at this link. This e-book, which has been downloaded over 10,000 times, provides detailed guidance on how to start your spend analysis and visibility journey. Looking forward to seeing you at ProcureCon! And remember to register with the “PCA14SI” code. This entry was posted in Advertisement, Event on January 30, 2014 by thedoctor. According to Wharton, You Should be Marketing Now! Wharton recently published an article on managing in an upturn, quoting famed Wharton professors Morris Cohen, Lawrence Hrebiniak, Peter Cappelli, and Oliver Chatain. The article offered up some very sound advice on how to successfully manage your business through the upcoming upturn. Buried among the nuggets of insight, which, by the way, echo many of the sentiments that I’ve shared over the last year, was one by Olivier Chatain that couldn’t be more timely. According to Chatain, areas of opportunity can be found in products or computing software that increase productivity and companies that sell these types of products and services should be ramping up production and marketing now. I wholeheartedly agree. Even Forrester has found that investment in procurement technology continues. After all, what other vertical offers software that, when properly applied, can lower transaction costs while reducing purchasing costs? Vendors, this is the quarter where many of your potential customers will be fighting for budget to acquire new sourcing and procurement solutions to help them increase efficiency and lower costs in the year ahead. This means that now is the time you want your brand to be front and center, because most budget requests are made based on the “baked-in” cost of the preferred solution… yours! So where should you put your marketing dollars? Well, as far as I’m concerned, you should spend some of them on one of the leading blogs that attract thousands of readers every day and tens of thousands of readers every month. There’s a big difference between push and pull when it comes to web information. While the first model might be accompanied by distribution lists of an impressive size, the reality is that over 90% of people don’t read the vast majority of information pushed at them (think about how much “junk” mail you open). But when someone chooses to visit a site, that’s a reader who is actually interested in what that site has to say — 10,000 unique visitors to a pull-blog are more valuable than 100,000 “subscribers” of a push e-mail list. Much more. If you would like to sponsor Sourcing Innovation, which reaches over 10,000 unique readers who are now making around 50,000 visits to almost 200,000 pages every month, information can be found on the side bar to the right of this page. This entry was posted in About us, Advertisement on September 27, 2009 by thedoctor. This entry was posted in About us, Advertisement on June 10, 2009 by thedoctor. This is an advertisement for the doctor‘s services. Regular programming will resume with tomorrow morning’s post. In this morning’s post, I outlined a sequence of steps that buying organizations can take to return to business as usual and put this recession behind us. However, I know that many of you won’t be able to do it alone, especially with all the FUD that some of the bigger vendors have thrown at us over the years. What’s really needed is clear and concise information that will help you make the right decision. I can help. I can help you select the right product and then hook you up with the right services provider to make sure you get this very important process right the first time. The biggest initial savings come from expert consultants familiar with your business, who know where the biggest savings are likely hiding, and who can find them quickly. Most importantly, because my particular expertise in analytics is in designing, building, selecting, and integrating systems, I can show you how to get continuous (not just one-time) value from spend analysis, using an appropriate-for-you mix of in-house and contract resources. Technology (hardware, software, and IT operations) is always an area with large savings potential. I can help you understand what you need, what you don’t need, and what you should be paying. Outside of the technology category, I can help you identify the appropriate category experts to get you to the next level. This one of my particular areas of strength, and I can help you with the RFI, evaluation, selection, negotiation, and implementation. I know the process, the systems, the requirements, and the true costs inside-out, backwards and forwards, and blindfolded. I can make sure you don’t get bamboozled and shell out a ridiculous amount of money for a product that’s not right for you. There’s RFP Help Here. Systems. Processes. Technologies. I can help you with one, or all. I can do a one or two day “blitzkrieg” session on a technology or process of your choice and supply the background you really need before you select a new e-Sourcing, e-Procurement, Optimization, Spend Analysis, Trade Visibility, or other piece of supply management software. After you select the system, I can help you modify your processes to get the most out of that system. This entry was posted in About us, Advertisement on April 17, 2009 by thedoctor. Consulting Confusion? the doctor Can Help! In this morning’s post, I outlined a sequence of steps that consulting services providers can take to return to business as usual and put this recession behind us. Based upon the conversations I’ve had over the last nine months, I know that many of you could use some help, especially in marketing and thought leadership. In this post I’m going to outline what I can do to help with respect to the points I brought up. It is important to focus on your strengths. If you have options, and can’t decide which ones to pick, I can help you with market research, so that you can make a fact-based decision. The best consultants are, by definition, doers. They’re usually not the best writers, marketers, or self promoters. I can work with you to get the thought leadership out of your head and onto e-paper. Then I can help you put together compelling white papers, talk outlines, webinar outlines, and other thought leadership pieces that will help to establish you as a leader in your (supply management) niche. the blog that is”hit” an average of 4,500 to 5,000 times a day from over 1,500 unique IPs. So put your logo here on Sourcing Innovation. In an uncertain economic climate, it is important to create a plan that will allow a client to maximize your services over the long term, and maximize their own success. Because of the large number of entities whom I talk to, I have a unique perspective that cuts across consulting, vendor solutions, and end users. I can help to refine a practice area for maximum impact. This entry was posted in About us, Advertisement on April 16, 2009 by thedoctor.